Long before anorexia, our son had what you might call 'puppy fat' at primary school. He was also much quieter and was bullied by a boy who viewed him as an academic rival. But once at secondary school and away from the bully, he threw himself into lessons, sporting activities and his new circle of friends. He was very happy at school and at home. The weight dropped off, but in a healthy, normal kind of way. At secondary school, he developed a passion for sport – and was very good at it. He became a star player in the rugby team and also played for his local team. Pre-anorexia, he also enjoyed squash, swimming, walking, cycling, cross-country and athletics. 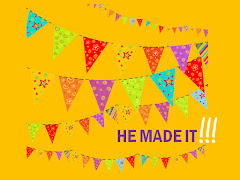 He and his dad even did the grueling Coast2Coast cycle ride. In those pre-anorexia days, our son was a physically fit and energetic boy, he had a lovely circle of friends, he had an encyclopedic knowledge of history and geography - and he was consistently top of the class in a range of academic subjects. Never, in a million years, could we ever guess that anorexia was about to muscle its way into our lives – especially since anorexia is usually considered to be a 'girls' disease’. On holiday in France he was swimming 100 lengths a day of the pool (mind you, he'd done that the previous year so we weren't unduly concerned). But he was also going for a run every day, turning down offers of ice cream, refusing to put butter on his toast, making his own pack lunches and increasing his intake of fruit and dried fruit. When we got home he joined the local gym, went on lengthy and very grueling runs, and started to see his friends less. This concerned us because up to then sleepovers, meals out, cinema visits and hanging out with his mates around town had been a regular part of his life. He also seemed quite subdued. He seemed to have lost his usual zest for life and his sense of fun. In September 2009 my husband’s parents came to stay and my mother-in-law immediately commented on how much weight our son had lost. I guess when you see your child every day it's not so obvious. She hadn't seen him for six months. Around this time, his obsession with ‘healthy eating’ reached a height. He cut out all fats and cut down his general food intake severely. He also developed a passion for fruit and dried fruit which he would spend ages ritualistically chopping into little bits before eating slowly. It was probably mid to late September when I became sufficiently concerned to make the first of three appointments to see our GP. On the first couple of occasions, the GP weighed him and measured his height, asked if he was worried about anything or depressed. Then he told him to go home, eat more and come back in a couple of weeks. By late October, the school nurse became involved, because our son’s behaviour had changed so much – and it wasn’t simply our son ‘being a teenager’; it went far deeper than that. Anorexia had taken over our son and our family. And anorexia isn't just about eating; it's about a stack of other symptoms - like depression, panic, zero self-esteem, etc. I don't just mean feeling a bit 'down' now and again, I mean deep, dark depression and self-hatred. I mean banging your head against the wall, or thumping your fists against your skull, throwing things around and animal screaming kind of depression. Other staff were worried. The sports staff commented on his severe loss of weight. From Number 3 in the rugby team, they’d moved him to the less demanding Number 8 and were now questioning whether he should be playing rugby at all. Other staff had noticed him ‘punishing himself’ in the school gym and on cross country. Naively we thought we'd get an appointment right away and were horrified to find the waiting list could be 18-22 weeks, crucially NOT from the day of the referral but from the day CAMHS wrote to us to tell us we we'd been added to the list. It was 23rd November before that letter arrived. A quick calculation told me it could be EASTER before we got help. I wanted to scream!!! Meanwhile it broke my heart to pick him up from school. I’d watch the other teenagers, joking with each other and looking the picture of health. Then I’d see my son, dragging himself across the car park, skinny as a rake, dark rings round his eyes and looking as miserable as sin. With the CAMHS treatment so far away, we started to panic. We simply had to do something to stop our son from disappearing in front of our eyes, physically and mentally. In the end we managed to find a private therapist who provided a bit of 'stop gap' treatment. But it was a bit like trying to stop the Titanic from sinking by sticking a Band Aid across the hole. And still the CAMHS waiting list loomed ahead. What state would he be in by the time our place came up at Easter? And how quickly would the treatment take effect? With anorexia it’s as if someone else moves into your head. Someone that taunts you all the time, telling you you’re fat and unattractive and that you’ll never be popular until you get thin. Anorexia has you pinching the skin on your skinny stomach, taunting you that it’s rolls of fat. Anorexia makes you exercise like mad and examine yourself in the mirror critically. Anorexia makes you hate what you see. Anorexia lies to you that it can make you ultra handsome, ultra slim and ultra confident. Anorexia lies that it can put you in control of your life. And part of this control is to control exactly what goes into your stomach, how much of it and when. The minute you deviate from this rigid eating pattern, anorexia lies to you that you’re out of control. Just one serving of dinner that’s not the 'right size' and anorexia can have the sufferer banging their head on the fridge and screaming. I know, because that’s what our son was doing by February 2010. Anorexia tempted our son with promises of looking physically perfect. His main aim was to get a 'six pack' to impress the girls. With this 'six pack' would come increasing self-confidence and popularity. By eating less and exercising more he would achieve his aim. His role models became the Adonis-style men you get in men's fitness magazines in the same way that girls might aim to look like the impossibly gorgeous, size zero celebrities or models you get in women's magazines with their personal trainers, designer clothes and hours of dedication in the gym. The only problem was that in practice it didn't work out like that. Anorexia robbed our son of his self-confidence, his self-esteem, his social skills and his sense of fun. He even lost his much sought-after 'six pack' as the anorexia began to eat away at the muscles in his body. By the end of 2009, his body was emaciated due to the anorexia. He had dark rings round his eyes, his face was gaunt, his skin was dry and flaking, his body was skeletal and he was permanently cold. Anorexia had lied to our son. But that's the nature of anorexia. Looking at family photographs was a painful, instant reminder of what he used to look like and should look like, but didn't anymore. We had a thin waif for a son who looked like a concentration camp victim and whose mood was so volatile I was terrified every time I picked him up from school for fear of how his day had been. For any parent, watching your child suffer with anorexia is one of the most excruciating and painful things you'll ever face. I just wished there was a magic pill you could take and - Hey Presto! - our old son would be back. I wept every single day. Unlike a physical illness, you can't take any medication for anorexia (apart from anti-depressants). You can't have an operation and it goes away. Worse, the wonderful, level-headed, intelligent child you've spent 16 years rearing and getting to know has undergone a total transformation into a volatile stranger whose very sanity seems to have gone AWOL. You feel frightened – an emotion that quickly changes to fear and terror as you scour the Internet for information about the illness and read the mortality statistics. Then you panic as you realise just how far away the first treatment session still is. Anorexia also makes you feel very isolated. 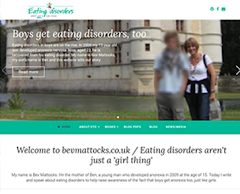 Okay, there are anorexia help lines you can call and a fabulous forum (see the links page for details) - and the CAMHS team. But it's difficult to talk to a 'lay person' about it; to the outside world it's such a little-known, much misunderstood and even taboo condition. 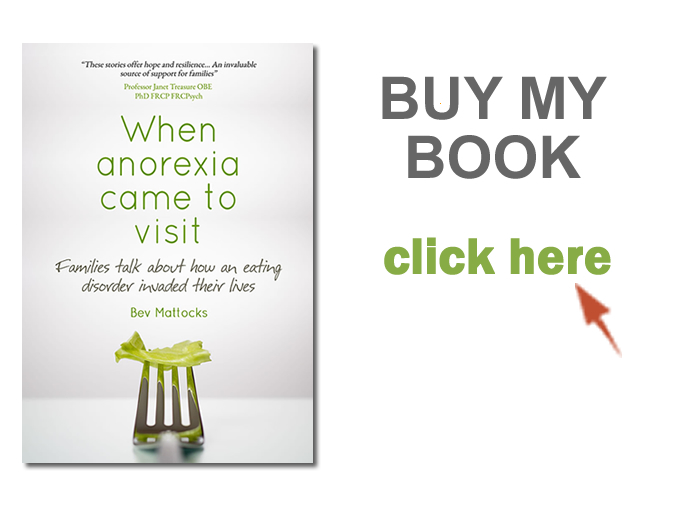 I knew virtually nothing about anorexia until our son contracted it. 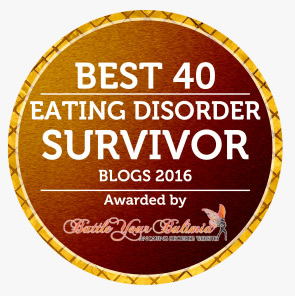 Over the following 18 months or so I became an anorexia expert! The learning curve was ENORMOUS – and necessary. It was around February 2010 that I discovered ADTD. Over the next 12 months this forum, and the amazing women I met through it, would become a lifeline. I read the books they suggested and talked to them at length, often over the phone. After feeling so isolated, it was incredible to talk to people who had gone through the same thing as us – and to see that our son’s symptoms were typical of this horrible illness. But most importantly, to see that there is light at the end of the tunnel, eventually, and to learn the most proven and effective ways of heading towards that light. In addition, he'd send me umpteen distressing texts about how terrible he was feeling and how alone... He had virtually cut himself off from his friends, retreating to his isolated corner of the common room and munching his way through salad and fruit at lunch. On really bad days, I'd go in to school and bring him home - or not send him at all. On one particularly bad day I took him back to the GP. Our son walked out shouting "I don't know what I'm doing here!!!!" and stormed off down the road. Evenings became a lottery where anorexia would usually win and our son would end up in a terrible emotional state. I started to be terrified that he might take his own life; in fact this was my greatest fear at the time. I was in tears on a daily basis, though I was aware that the 'experts' say you should show a calm front to your anorexic child. Easier said than done!!! Our son used to love eating at a certain city centre cafe. And that Saturday in February we went into town and decided to go there for lunch. From the moment we went in, he was frantically examining the packaging for calories. Most were too high. He asked me what I thought he should have, then agitatedly picked up something totally different. The café had started making single sandwiches, so that was his natural choice. He must have picked up and put down virtually every sandwich in the shop. We even made it to the till on two occasions only to have him rush back and change his mind. Then he had some kind of breakdown, strode under the staircase and started to weep. So we tried again to choose lunch without success. In the end he strode out of the cafe with me frantically following him, chasing him through town. We did manage to get a quick bite to eat elsewhere (amazingly enough). But by then we were both totally frazzled, all thoughts of shopping totally gone. Our son liked to 'admire' cakes (in a cafe or shop) in the way you or I might admire paintings in a gallery. Of course he would never eat any. In supermarkets he would examine food packaging meticulously, picking stuff up, then putting it down – or removing items from my trolley. I began to hate the people that decided it was a Good Idea to list the nutritional content on food. Another anorexic behaviour was the need for food / meal perfection. Anything less than a perfect meal could send him into a freak-out frenzy which resulted in more than one restaurant walk-out – or meals out where he’d just stare at his untouched food, miserably, or break down in tears. In January 2010, after being on the CAMHS waiting list since November, we received a letter with an appointment for mid February, some six weeks earlier than we'd thought. The relief! But then in early February I got a call from school. Our son’s pulse was just 30, his heart was thumping in a strange way and the school nurse thought I should take him to A&E (ER). In A&E we were fast-tracked past the usual queue and within minutes he was wired up to an ECG machine. Blood tests were also taken. He was whisked off to another local hospital with a specialist cardio unit. I was whisked off into a living nightmare. They kept him in overnight, wired up to machines. But thankfully his pulse had stabilised a bit by the next day, enough for him to be discharged. His blood, etc were also fine - so the specialist wasn't unduly worried. But what he did say was that the heart issue could have been exacerbated by the anorexia. So I got on the phone to CAMHS to ask if we could see them sooner. Our CAMHS treatment started out as a multidisciplinary team comprising a psychiatrist, nursing specialist and dietitian (who we were to lose in the summer, due to cut-backs). Naively I thought that treatment would be quick – and it could be just weeks, months at the most, before we got our ‘real son’ back. Unlike physical illnesses, you can’t just take a course of medication or an operation to ‘cure’ the anorexia. Because it is a mental illness, the treatment is very different. I decided that keeping our son in school wasn't doing him any favours. He was spending most of his time in medical or being picked up by me. He was missing lessons and schoolwork. So we decided it was time to have a meeting with the Head. He was brilliant, promising that the school would support our son in whatever way they could. I took our son out of school the next day and the staff were excellent, emailing work home which we would bring into school once a week for marking and to pick up more work. Our son spent the rest of the lead up to his GCSEs like this (and went on to get excellent grades!) Since then, the school has continued to go way beyond the ‘call of duty’ and the wonderful school nurse has become a good friend! Around this time I stopped taking our son food shopping because he would analyse nutritional content and take ages choosing products. He would also freak out over stuff he found in the fridge because it was impossible to ban him from the kitchen in such a small house as ours. Throughout March we felt we were making improvements, although we were well aware that it was in the artificial environment of home, with our son out of school. We felt it was important for him to re-establish links with his friends and a good opportunity was a history conference he'd booked onto in March. It was a success, his friends had been excellent and he was very upbeat afterwards. But then he had another meltdown - a total breakdown where I had to physically restrain him from injuring himself. He confessed to secret exercising and lying about what he'd eat in meals he'd prepared for himself. He said the so-called improvements we'd noticed were lies, even the weekend's normal behaviour was anorexia pretending to be our son. At the conference he'd been secretly exercising in the toilets. He said all the good stuff was fake, the anorexia putting on a front and being a good actor. He said that his days are just filling in gaps between meals. Food and anorexic thoughts dominate his day and control everything. Even the nice country walks we'd had were only a means of burning off calories and 'earning' an evening meal. This led to more fights at mealtimes. Typically he'd put down his knife and fork, walk out of the room, start banging his head and shouting in an animal voice trying to get the anorexia 'demon' out of his head. He'd swear at the top of his voice and be horrible. Then he'd return to the table, knuckle down and finish his meal, changing the subject to pleasant 'chit chat' and acting as if nothing had happened. Meanwhile you can imagine what was going on in my head!!!!! Initially we worked on a strict eating plan comprising 3 meals and 2 snacks a day which came to around 2700 calories. This was easier said than done because our son just wasn’t ‘buying into’ this. By virtually force-feeding him, he was almost ‘weight restored’ by June 2010. It was fantastic to see our ‘real son’ returning physically. However, mentally he had scarcely changed at all. It was at this point that we started to have problems with our CAMHS team. They felt our son was doing brilliantly and was almost ‘cured’, but I knew very differently. There began an unsettling period of ‘triangulation’ as the anorexia deceived the CAMHS team into believing our son was almost ‘there’. So much so that they insisted we dispense with calorie counting altogether during our summer holiday in France, they were so confident our son would be able to cope. Of course the anorexic 'demon' immediately took the side of those that would make its possession of our son even easier and we parents because the ‘baddies’ of the triangle. The French holiday was the start of a massive downward spiral, weight and mood-wise. The holiday itself was a nightmare from Day One when we had a huge row with the anorexia ‘demon’ on arrival at our holiday cottage. At several points, we almost came home early. It was terrible. Back in England, our son had lost a huge amount of weight. He also refused to return to the eating plan – and CAMHS allowed him to begin to control his own eating which I instinctively knew was the wrong thing to do at this stage. Not only did his weight plummet over the summer holidays, his mood hit rock bottom. The depression got worse, as did the resistance to eating, and it was a real uphill battle to keep things afloat. Meanwhile he continued to lose weight; something which continued for the next few months as he headed to his lowest ever weight (but not low enough to warrant hospital admission). The summer holidays were a nightmare with regular threats of suicide. He even tried to climb out of the loft Velux window on one occasion. Looking back, this period is a king of nightmarish blur as I realised that I almost had to come to ‘accept’ that I might lose my son. His psychiatrist suggested starting a course of Prozac to help lift his mood and it wasn't until September that he finally agreed to take it. Prozac takes a few weeks to work, but once it did, it levelled out his mood and proved a true crutch. Considering he had been away from school since Feb/March, I was really nervous about him starting back in the Lower Sixth Form in September. I was worried about the social problems (he'd found it difficult to walk across the playground or even sit his GCSE exams with his peers). I was worried about school dinners and the fact he'd be eating next to nothing. How would we manage them? I didn't live locally so I couldn't go into school to monitor them. The first week or so weren't good. He avoided his peers like the plague and spent all his time including breaks, lunchtimes and free periods in the library, swotting. Meanwhile he began a brand new phase of not sleeping due to anxiety - and I mean REALLY not sleeping; at the most a couple of hours a night. Lunches were predictably disastrous which resulted in me sending him in with packed lunches which also proved pretty disastrous as he was still resisting food unless actively encouraged by me being there physically. After a few crises, we - with the fantastic support of the school and at the suggestion of CAMHS - made a decision. He would go into school mornings only and come home for lunch. School would send home work for the afternoons and friends would lend him their notes. On days when he didn't sleep, he often missed school altogether. However his sheer determination to keep up with his peers, the fact he's pretty bright and the incredible support of the school has meant that he's not doing too badly at all. But the most important thing to me isn't whether he gets straight A's and gets into university; it's that he eventually recovers - fully. In late September, something changed at CAMHS. I’m not sure what, but it's as if they suddenly 'got it and almost immediately I felt we had arrived ‘at the same page’. It might have been the terrible summer, often with emergency visits to CAMHS, plus the severe weight loss. It was also 'helped along' by our son’s readmission to hospital with a dangerously low pulse rate. It was as if everything suddenly ‘clicked’ into place all round. CAMHS transformed and accepted that our son wasn’t as far advanced in recovery as they had assumed. And our son himself had a total change of attitude. He started back on the eating plan. He stopped cheating and throwing away food. The resistance all but stopped (although it did / does reappear now and again). More importantly, he started to put on weight and accepting the need to put on weight. Things gradually began to improve on the social front - no more escaping to the library! At the time of writing (February 2011), he is still in school mornings only and some days he doesn’t make it at all. But that’s mainly because of the insomnia. These days he loves lessons and being with his friends. Exercise has always been an issue in the fight against anorexia. From being something our son enjoyed, it became a hated compulsion as he continued to use exercise to lose weight and grow muscle. At a CAMHS session in January 2011 he was (brutally) honest about his exercising habits (or, more correctly, compulsions). He described his 7-days-a-week exercise regime. Because of a low pulse rate and low body weight, he isn't permitted to do PE at school for the time being. We are all aware that he has a problem with compulsive exercising to compensate for this, and also to ensure he doesn't 'put on enormous amounts of weight' (as he puts it) from week to week. It's a kind of purge, almost like a sufferer of bulimia might vomit to control their weight. The extent of his compulsive exercising was HUGE - much bigger than any of us imagined. Just when we thought he'd listed all his "100 crunches, 100 sit-ups and 100 press-ups" for any one day he'd interrupt with "I haven't finished yet! ", not just once, but several times... And he listed exactly how many of which exercise he did when during any day, school days and home days. I remember being stunned when he confessed to having exercised in the middle of his GCSE art exam practical when the invigilator was out of the room. Peers told of him asking to be excused to visit the bathroom in lessons only to spend the time running around the school grounds. At the moment we are trying to break this cycle. But the Good News was that he was brutally honest about his exercise regime (and how much he hates doing it). Back in November, our son asked CAMHS to come into school to talk to a selected group of his peers and a couple of members of staff (without him being present). It was extremely successful and CAMHS were impressed with the maturity of his peers, their loyalty towards our son as a good friend and commitment to be there for him throughout his recovery. Our son’s male friends had never talked about his problem, feeling more comfortable ignoring it – and keeping him at a distance. They’d probably never even heard of eating disorders before this happened. The girls were far more accepting of it - and willing to talk things through with him in depth. In fact at the time of writing, he has more female friends than male friends. And all his friends are really lovely, caring people. Our son is now 18. Over the past few months, what has helped the most is my own change of attitude. From panic and fear, I managed to become much calmer and more gently supportive /encouraging. It’s not been an easy change, but it has helped enormously. Janet Treasure would describe it as the 'Dolphin Approach'. I've also found our Recovery Contract massively helpful (introduced 13 months ago - see tab at top of page). All of this has led to our son being able to talk to me. I mean really talk. Honestly and from the heart. Over the past few months, usually on long and regular walks in the countrywide, he’s completely opened up to me about what it’s been like to have anorexia and the stage he’s at now. The other day he said how much he appreciated our 'little chats' finding them 'incredibly therapeutic'. I explained about how, for ages, I felt that I was banging my head against a brick wall. We'd talk about recovery on these walks and he would promise to do X, Y or Z, but he'd rarely keep his word. As I watched him get thinner and thinner, and more embedded in the anorexia, these walks and talks broke my heart, especially on days when things seemed totally without hope. But lately, things have been very different. We're going over similar stuff, but the difference is that, since the Autumn, our son has been actively committed to his recovery. We have turned a corner. These days, he follows up suggestions or discussions and we make significant progress. Far from banging my head against a brick wall, I actually feel I am doing good. We talk about exercising (how he's making a real effort to cut it back, and managing to do this reasonably successfully)... about easing back into school full time (and examining the problems that are making it hard for him - and working out ways to overcome them)... about socialising (the importance of the fantastic friendships he's developing with his supportive friends)... about eating (What has he found difficult this week? What challenges has he made himself? Were they successful? Plus, contrasting how different eating is now compared with several months ago)... about what life will look like without the anorexia (why he really looks forward to having kids when he's older - and also why life without anorexia seems real now, whereas only a few months ago it seemed unobtainable)... and so on. But as any parent of a recovering anorexic will know, you have to keep your eye firmly on the ball, albeit at a discreet distance. This is because the anorexia will do its utmost to fight its way back in. The trick is to move on from a ‘bad day’ or 'bad incident' and start again with a fresh frame of mind, usually having a chat about why things might have gone wrong and how this could be prevented happening next time round. There is light at the end of the tunnel - and, believe me, when you catch a glimpse of it the light is BRILLIANT!